I’m sure I’ve mentioned this before, but I’m part Scottish. Descended from Frasers from Fraserburgh; we still have family in Aberdeenshire. Yet somehow, I’ve never celebrated Robert Burns Night. Not officially, anyway. I don’t know how I keep missing out on this, but I do. This year, though, I decided to wade in and give a kind of celebration a go. Most of this was easy to arrange, even at the last-minute (I just made this decision tonight): I have two kilts to choose from, bagpipe music to play, some Robert Burns to read, and whisky (both blended and single malt) in the house. All that was left was the haggis. I’ve actually never had haggis. I gave up meat before I ever had a chance to sample it. 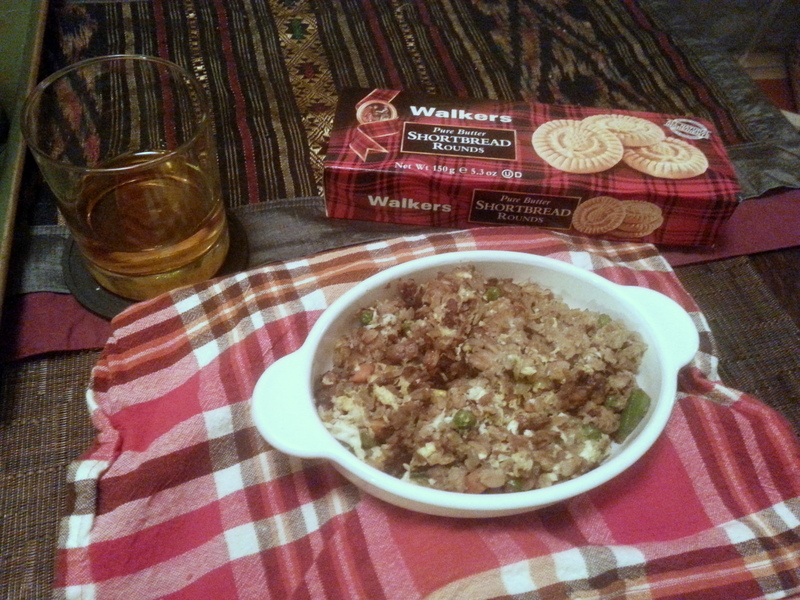 But I know there are plenty of recipes for vegetarian haggis, so tonight I looked one up and gave it a go. I preheated the oven to 375, and then I heated the oil over medium-high heat in a wok (I know — bare with me; there’s a reason) and then sautéed the onions. 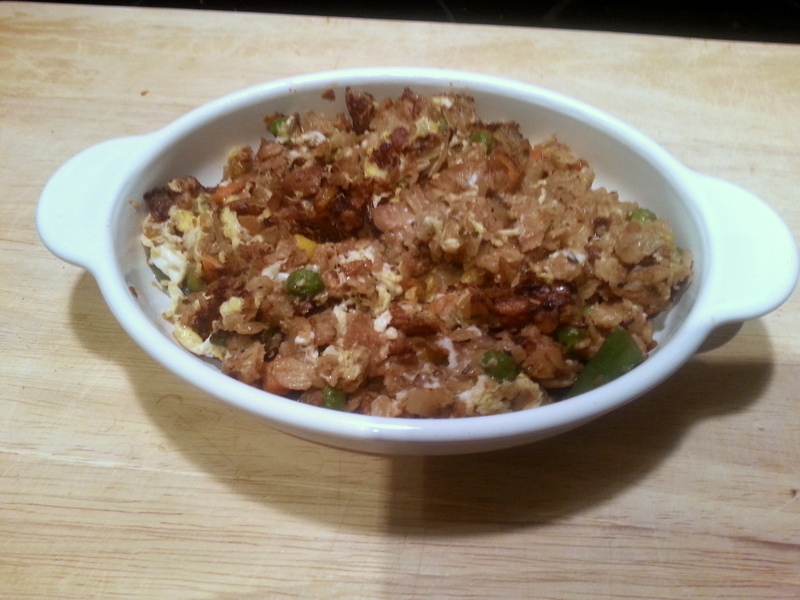 After a few minutes, I added the other veggies, and after a few minutes more, I added the “meat” crumbles and the nuts. I stirred these in the oil for a few minutes and then pushed the veggie/meatless mix aside, up the wall of the wok. I added a little more oil in the bottom of the wok and tossed in the hashed potatoes. I fried these on both sides and then mixed everything together again. I added all the seasonings and then sautéed the mixture for a few more minutes. Once everything had cooked, I pushed the mixture up the walls again, away from the heat. I turned up the burner to high and poured in the vegetable broth. Once it boiled, I added the oats, stirred them until they were moist, and then I pushed the whole veggie mixture down into the broth, cut the heat to low, and covered the wok to simmer for 10 minutes. While the mixture was simmering, I beat the egg and sprayed a crockery dish with cooking spray. Then I cut the heat altogether and moved the wok off the burner, mixed in the beaten egg, and transferred the whole mixture to the crockery dish. I covered the dish and baked it in the preheated oven for another 10 minutes. Honestly, this isn’t really anything like any haggis, vegetarian or traditional, that I’ve seen. It was just a first run at things using whatever I had on hand. The texture wasn’t minced and “pudding-like” enough; in future runs, I’ll chop everything finer, and I’ll probably include mashed beans for a thicker, more paste-like texture. I also should have let the mixture cool completely before adding the egg, so it wouldn’t cook into fried-rice-like chunks as soon as it came into the mixture, but I was short on time and it was fine. And I wish I’d had a vegetarian “sausage casing” or even a filo dough — something to stuff the filling into or wrap it with, instead of just spreading it into this dish. I also would omit the hashed potatoes (which I included mostly because I was short on time and didn’t want to bother with the traditional side dishes of “neeps and tatties” — mashed turnips and mashed potatoes). Still, the oats and the nuts gave it a nice gritty texture, and covering the dish allowed it to bake in its own seasoned juices, so it tasted fine to me. And considering the whole thing took me little more than half an hour to cook, beginning to end, I think it turned out pretty decently. Better still, it was a terrific complement to my whisky (nothing fancy — just a simple Walker Black — but I’m having a nice single malt later tonight). And yes, I walked my dish from the kitchen to the dining table to the tune of bagpipes, and I read Burns’s “Address to a Haggis” before sitting down to dinner. After dinner I smoked a pipe with another whisky, and now I’m nibbling shortbread and writing this. Not exactly a traditional Robert Burns Night, but it’s mine, and for a first, it’s been grand. Wee scuddler o’ the pudding race! Wow, what a recipe , thank you for sharing. I am a vegetarian too, since I don’t remember? Love the song you shared! My pleasure! It’s not terribly authentic, my recipe, but it’s quick and it tastes great. Glad you’re interested!